Families and staff at the Janet S. Munt Family Room in Burlington on Thursday celebrated the return of two employees whose positions had been cut last November. As Seven Days then reported, the program’s parent organization, the Visiting Nurse Association of Chittenden and Grand Isle Counties, cut programming and three positions after its application for a grant for close to half a million dollars was turned down. Linda Alderman and Rosie Senna returned to their jobs on April 25, but Thursday was the first day that they were part of the Family Play programming, a day where there’s free on-site childcare and parents socialize or take English classes. The Family Room is a parent-child center that operates at St. Joseph School in the Old North End. The amount that was needed to reinstate two positions was $70,000. 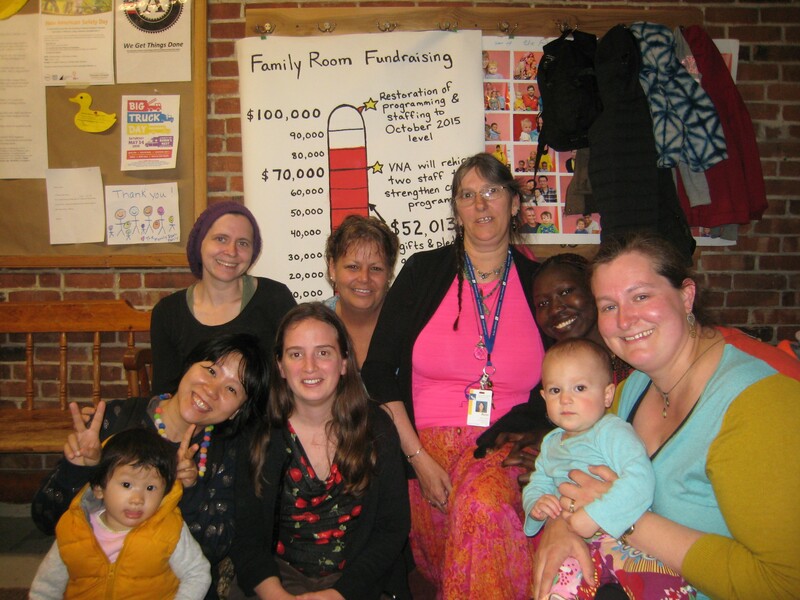 The VNA Family Room parent and community advisory council raised a little more than $80,000, according to Sophia Donforth, a member of the group. Most of the money came between January and March, she noted. “I’m proud of what we pulled off,” Donforth said, adding that Burlington Mayor Miro Weinberger’s pledge of $10,000 in city funds was a “strong statement” of support. “It’s pretty humbling and gratifying to have the support of a large community,” said Alderman. She did “odds and ends” around her house after she was laid off. Alderman is back to working 37.5 hours per week at the Family Room. Senna had continued to volunteer at the Family Room and tried to find another job. She worked at the Pine Forest Children’s Center for about a month before she was reinstated at the Family Room. “It was nice to come in, have the key and know what to do,” she said. She works 30 hours each week at the Family Room. A third staff member who was laid off chose to retire. The Family Room has been “flooded” in the past few months with new families following increased public awareness, noted Samantha Stevens, the program manager. “It was interesting to manage with fewer staff,” she said, adding that the remaining employees and volunteers came together. Donforth said the two positions are temporary and that Alderman and Senna have their jobs until April 2017. The Family Room, which has been part of the VNA since 1988, will be going its own way, according to a statement from its parent organization in March. This transition is expected to take at least a year. The parents group wanted the VNA to guarantee that Alderman and Senna will have their jobs until that transition. Donforth added that the pair are not entitled to benefits from the VNA because they are temporary employees.